Mr. Angel joined Bloch & Chapleau, LLC as Of Counsel in 2016, and became a Senior Associate at the firm in 2018. He is a graduate of Miami University, (B.A., 2003) and the University of Denver Sturm College of Law (J.D., 2007). 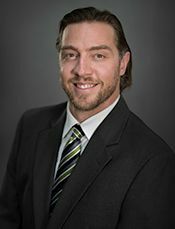 He began his legal career in Colorado in 2005 and has lived and practiced law in the Continental Divide area since 2006. Mr. Angel served as a Deputy District Attorney for the Fifth Judicial District from 2007-2012, prosecuting in the Clear Creek, Eagle, Lake, and Summit County offices. He transitioned into private practice in 2012. Mr. Angel is highly regarded for his courtroom skills and has taken over 30 cases to jury trial. Mr. Angel is a passionate advocate for his clients with a unique background in psychology and interpersonal violence. Mr. Angel specializes in civil litigation, domestic relations, criminal defense, and crime victim representation. Additionally, Mr. Angel has filed and defended numerous appellate briefs and post-conviction pleadings. Mr. Angel is a recognized trainer on a community, state, and national level. He routinely provides education and training to organizations, attorneys, law enforcement, and mental health professionals on a variety of victim issues including domestic violence, sexual assault, child abuse, juror education, and jury selection. Mr. Angel is engaged in statewide legal leadership and currently serves as an executive board member with the Bar Association He is also an active member and contributor to the Colorado Bar Association and the American Bar Association. In addition to his work with Bloch & Chapleau, Mr. Angel currently serves as the Legal Advocacy Coordinator for Advocates for Victims of Assault, Inc., located in Summit County, Colorado.